Uses: Airport, Crowd Control, Maintenance Projects, Other Markets Colors: Browns/Tan/Beige Lengths: 9 panel 16'-9" Heights: 5'-9"
The Port of Miami is the world’s leading cruise port and the largest container port in Florida and serves as a contributing factor to the Florida economy. With almost 5 million passengers and over 1 million Cargo TEUs to date, safety and security are the utmost importance for the employees and passengers. The Port of Miami authorities contacted Screenflex looking for a high-quality, movable privacy screen to add to their port security equipment. The room divider and privacy screens is an economical and reliable way to assist with the traffic flow of passengers at the myriad of security stations. 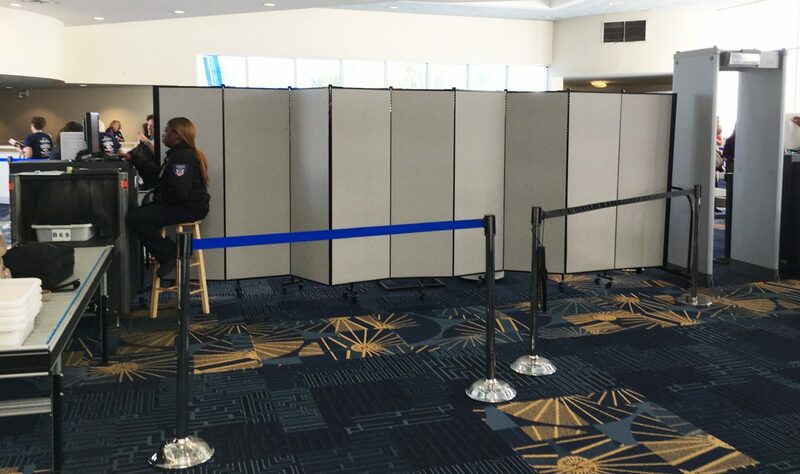 After they received their dividers and began using them, the employees found new ways to use the temporary walls: as a private passenger screening area, a waiting room for passengers before or after their cruise, luggage security check points, and storage areas. With 36 sizes and 38 colors to choose from, your space savings movable walls are right within your reach.